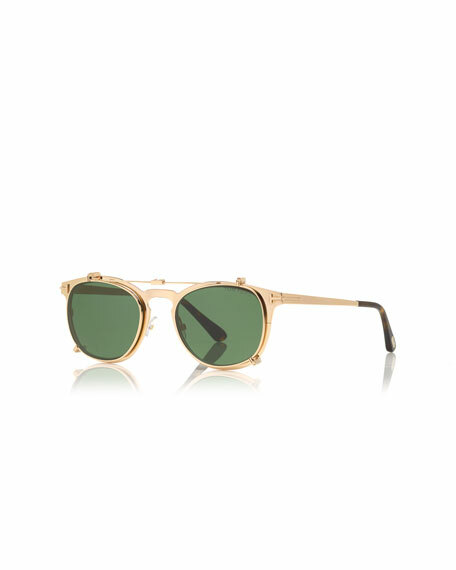 Tom Ford Special Edition clip-on sunglasses. Special edition wooden box and leather glasses case included. For in-store inquiries, use sku #2150082. TOM FORD "Charlotte" butterfly sunglasses in metal. Lens/bridge/temple (in mm): 62-15-145. Lens over frame, mirrored lenses; logo script. Signature "T" at temples. Adjustable nose pads. Slim arms. 100% UVA/UVB protection. Made in Italy. 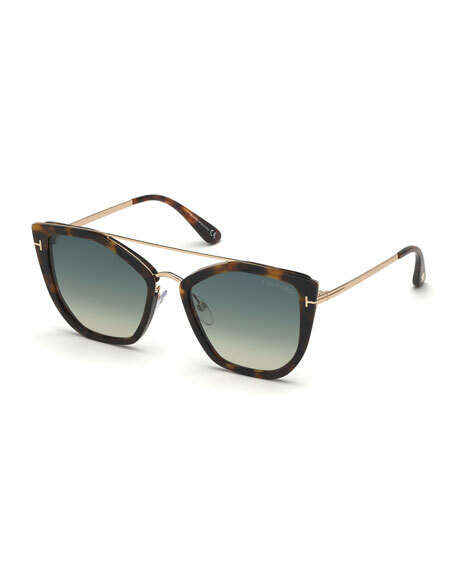 TOM FORD "Dahlia" sunglasses in metal and acetate. Lens/bridge/temple (in mm): 55-19-140. Gradient, butterfly lenses; logo script. Double nose bridge; straight brow bar. Signature "T" at temples. Thin, wire arms. Capped earpieces. 100% UVA/UVB protection. Made in Italy. TOM FORD butterfly sunglasses in metal. Lens/bridge/temple (in mm): 65-5-140. Gradient lenses. Cross nose bridge. Slim arms; capped earpieces. Can be fitted with prescription lenses. 100% UVA/UVB protection. Made in Italy. 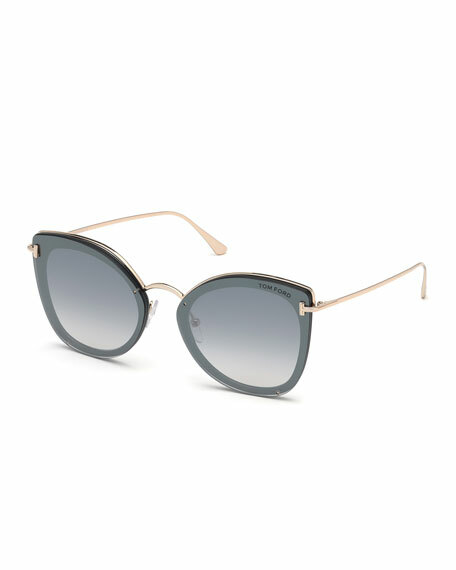 TOM FORD "Helena" square sunglasses in metal. Lens/bridge/temple (in mm): 59-15-140. Mirrored lenses; logo script. Signature "T" at temples. Slim arms. Adjustable nose pads. Capped earpieces. 100% UVA/UVB protection. Made in Italy.